As much as we would love to be able to plan all our trips to the dentist, there’s just no way to know when you’ll need the services of a 24-hour dentist. San Francisco patients that suffer a fall, a car accident, a tooth injury while playing sports, or sudden tooth pain, can still get incredible dental services 24-hours a day with Dr. Skoulas. All you need to do is call our offices at (415) 757-0110, and you’ll be connected to someone that can help. One of the questions we get asked from curious patients is what are the most common dental emergencies that Dr. Skoulas treats. In this blog post, we’ll look at the top 10 dental emergencies that we get called for. San Francisco patients live active lifestyles and are often out late at night. Most of the time, our late-night activities end with us heading safely to bed. But on rare occasions, our patients need a dentist in the middle of the night. When that happens, you can count on Dr. Skoulas to be there. Here are the top 10 dental emergencies that we get called to treat. Chipped or cracked tooth – An accident, sports injury, or a bad fall can all cause tremendous damage to your tooth. If your tooth has chipped or cracked, it can cause incredible pain as well. If left untreated, a chipped, cracked, or broken tooth allows an infection to get into the very core of your tooth. 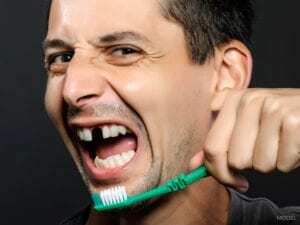 Loose or missing tooth – Even worse than cracking your tooth is knocking it out. The good news is that with a dental implant or a porcelain crown, you can replace the lost tooth with a strong, functional, and natural-looking replacement. Lost filling or crown – If your night out ends with you losing a filling or crown, it can leave you in tremendous pain. Tooth pain – An abscess or other infection in your tooth can occur suddenly. Patients will often experience no symptoms at all. Then one night, out of the blue, you wake up with excruciating pain. Foreign object stuck in teeth – Another common call we get is for something stuck between our patients’ teeth. Sudden swelling – This is usually caused by an infection in the tooth or gums. Jaw pain – One of the hallmark signs of an abscess is pain that throbs into the jaw and neck. But if you’ve had a fall or accident, it could be from the trauma. Cuts in mouth – On top of a cracked tooth, a bad fall can also cause cuts on the inside of your cheeks and gums. Wisdom teeth erupting – A unique dental emergency for our younger patients can happen when their wisdom teeth decide to erupt. Tooth sensitivity – If you suddenly start experiencing sensitivity to hot or cold foods, it could mean that you have a cavity or a crack in your tooth. San Francisco patients are used to living in a fast-paced city. That means that you also need to have a dentist that can keep up. Dr. Skoulas realizes that you can’t plan when you’ll need to visit the dentist. That’s why she’s available 24/7 for all your dental needs. If you get in an accident, have a sudden fall, or injure your mouth at a sporting event late at night, all you have to do is call our office at (415) 757-0110. You’ll be connected with Dr. Skoulas, and she will arrange for you to get treatment as quickly as possible. Weekends, weekdays, it doesn’t matter. We’re always here for you if you have any sudden dental emergencies. Plus, Dr. Skoulas is loved by her San Francisco patients for her kindness, gentleness, and compassion. Just take a look at our Reviews Page to see the kind of experience you can expect from Dr. Skoulas. We offer a full suite of anesthetic options along with Netflix and Spotify at every dental station to help you relax. Our modern and comfortable offices are located in the heart of the financial district for easy access at any time. Call our San Francisco offices today to get started!